Sorry to be late (and brief) with the writeup—am visiting with an old friend. 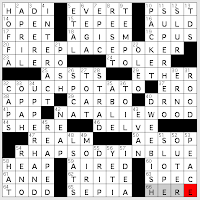 Her brother, by the way, had the best reaction of anyone to seeing my July 5 NYT crossword (co-written with Tony Orbach)—there was exuberance and there were swear words. It was richly rewarding. People should swear aptly more often. Andrea and Ashish's joint byline is so long, what I see on the applet is that the puzzle's editor is "Will Sho." Still, Ashish's previous byline with his friend Narayan Venkatasubramanyan still wins for longest. A&A's theme includes GO FISH, TAKE THE BAIT, OPEN A CAN OF WORMS, GET REELED IN, and [Hook, line and ___] SINKER. I can't quite decide if the long Down answers are definitely thematic or just quasi-thematic: UNDER THE SEA sounds good, but MARINE GREEN as the [Algae color] seems less fishing-centric. (Marine green is a color?) If they are part of the theme, it's a ginormous amount of theme material for a Monday puzzle. Super-smooth fill and light clues abounded. Favorite bits: [Instill with the three R's] for EDUCATE (my son returns to school on Tuesday); adjacent Simpsons characters APU and NED; and BLAH directly opposite an ETUI (editorializing?). The closest thing to a rough spot is COR as an abbreviation for corner ([Where streets meet: Abbr.]). That's all for now. Thanks for an entertaining Monday puzzle, A&A. If we DELVE further into the puzzle, we come across some more excellent fill in the descriptive if somewhat disparaging DWEEBISH for [Nerdy]. The SUPERHERO [Captain Marvel or Batman] definitely has the UPPERHAND [Controlling position] here—but what I like best is the way these longer words words INTERACT [Work together]. I semi-question the clue [Brilliantly colored fish] for OPAH. Take a look at that baby. While there're those red-orange fins, that is one shiny, metallic-looking body. It's not a "terrible" clue, but some of the fish on this page (the angelfish or the tigerfish, e.g.) better conform to my idea of being "brilliantly colored." And in the almost-totally-useless-information department, take a look at the two names in the SW: there's ANNE ["Green Gables" girl] atop TODD [Broadway's "Sweeney ___"]. A search of the internet and IMDb turned up not only Ann Todd, an actress and third wife of director David Lean, but also 1940s child star Ann E. Todd. Finally, if you're ever at a loss to know just where you are, I can tell you with certainty, ["You are ___] HERE." Los Angeles Times crossword by "Teri Smalley"
"Teri Smalley" anagrams to "it's really me," a.k.a. editor Rich Norris. 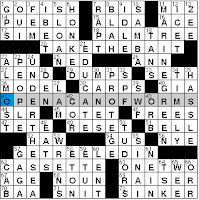 The theme is about things done in the NFL (61D: [Org where you can see the first words of 20-, 38- and 55-Across]). You PASS the ball, RUN with it, and KICK it, and those words begin PASS JUDGMENT ([Give one's verdict]), RUN INTERFERENCE ([Create a distraction]), and KICK UPSTAIRS ([Get rid of by promoting, as an employee]). What's sticking in my craw here is that the word INTERFERENCE is used in football, but it's not part of the theme because JUDGMENT and UPSTAIRS aren't thematic. It would've been good to have a RUN ___ phrase that didn't mix in another football term. 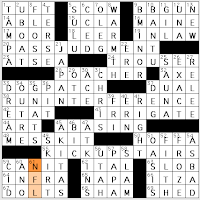 Brendan Quigley's blog crossword, "Themeless Monday"
Hey, you've got until midnight Tuesday to enter Brendan's crossword contest. 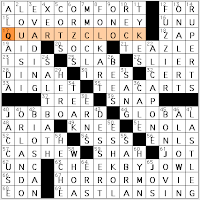 Lots of Scrabbly stuff (ALEX COMFORT, QUARTZ CLOCK, FUZZIER, BON JOVI, CHEEK BY JOWL, JOB BOARD), but more small pieces of awkward fill than you might expect in a 72-worder (ENLS, SDA, U NU, CERT, plural ORZOS). The last square I filled in was the I in AIGLET (33A: [Decorative bow]) and LOUIS II (2D: [Holy Roman Emperor known "The Younger"]). I know the spelling teasel, but not TEAZLE (21D: [Plant with lavender flowers]); the dictionary tells me teazel is also legit.